I have a small closet organization secret to share with you. Your small closets are actually pretty big. I’m talking about those small closets. There is a lot of room in those small closets and today I am going to show you how you can utilize ALL the space in your small closets so you can be more organized. The key to maximizing your small closet space is to look from floor to ceiling and visualize all the ways you can organize your clothing and accessories into this space. This could be hooks on the wall space, extra shelving or rods, and even utilizing that one spot at the front and very top of your closet. Are you starting to imagine how you can add more space to a small closet? Great. I used to be cursed with small closet spaces, or so I thought. Even now we have these tiny closets that were literally built in between wall studs in our bathrooms. The shelves can barely fit my hand let alone a big bath towel. I’ve always had to be super creative with my closet spaces and now I’m sharing all my tips and tricks with you. By the end of this post you will store more in your closets without stuff falling down all around you. This all depends on what your closet it used for. A bedroom closet will not be organized the same way a coat closet or linen closet would be. It’s important to first look at what the closet you want to organize will be used for. If it’s a coat closet in your front entryway ask what you would like to put in there. Would you like to store a vacuum, broom, and other cleaning supplies? If it’s a bedroom closet make sure you are only using it for clothing and not storage of extra things that don’t relate to clothing or sleep. Use your linen closet space wisely by only keeping what is necessary. No more than one extra sheet set per bed, no more than a couple of extra towels, and use the rest of that space to store other necessary household items. No matter what, the first step to an organized anything is decluttering. It means going through and getting rid of anything and everything that you no longer use or need. When you go to organize your small closet go through the items and decide exactly what you need out of the closet first. Then with everything else you determine what you will donate, what you will throw away, and what you will keep. In decluttering it’s ok to be a little vicious. If you haven’t worn it in a year and you don’t know when you will wear it again it might be best to just get rid of it. Once you declutter your closet it’s time to figure out what actually belongs in this closet. The next step is to make sure that everything in your closet actually belongs there. Too often we store things in closets when they would be better served in a different spot. Store extra towels on shelves in the bathroom or under the bathroom sink. Store extra cleaning supplies in the laundry room or kitchen. By only storing what is necessary to the room your closet is in you can free up loads of space and make the process of refilling supplies easier in each room. This will save you time, frustration, and lots of space. Now that you know exactly what is going into your closet let’s look at ways you can organize the whole thing to maximize your space. Adding additional bars to your closet give you extra space to hang clothing. This also allows you to hang clothing in an organized manner. This double hang closet rod gives you double hang abilities with no tools necessary. Or you can add a rod like this if you need more space. Placing shirts on top and pants on the bottom you can more easily decide on an outfit to wear. Or placing a lower bar in a hall closet your children can reach the bar to hang up their coats instead of leaving them on furniture. One simple addition to your closet can easily make it so your whole house stays cleaner longer. Stop the cluttered closet floor mess by using baskets or totes to organize shoes, purses, and extras. If you have a smaller overall house you can use baskets and shelving in lieu of dressers. Simple organize your folding clothes inside baskets in your closet instead of using a large bulky dresser for your clothing. Speaking of shelving add some more to your closet. Place shelf like this in the middle of your closet with attached rods on either side to maximize your space and keep it organized. This will allow for massive organization of folded shirts, shoes, and other items you need to store in your closet. Likewise you can add an additional shelving on the floor of your closet to keep things organized too. Too often we forget the power of wall space in our closets. On the back wall you can hang coat racks or hooks like these to hold purses, ties, belts, and scarves. You can add additional storage on the sides of your closet as well. This means all your accessories are easy to reach yet hidden away so you can easily find them. I also won’t tell your husband about that fabulous new purse that you’ve hidden back there. Just tell him you’ve had it forever if he ever mentions anything. If you have a door that swings open use the door space to hold accessories, jewelry, or shoes. It keeps your floor clear from clutter and is full empty space that can be utilized with ease. Hang command hooks on the inside of the door for all your necklaces. Hang small baskets to hold rings or bracelets. You can even create an earring holder using batting, pretty fabric, and a staple gun to create a place to put all your earrings. Utilize your floor space. Add small cubbies like these for shoes. It will keep your floor clear and your small closet organized. Place extra small totes organized by accessory so you can easily find exactly what you are looking for. Try nice drawers as a way to add extra space in your closet. Small closets can be horrible to deal with but with the right organization hacks they can store a lot of things pretty easily. Take stock of all the space in your closet and utilize all of it to get your clothing, coats, and storage under control. 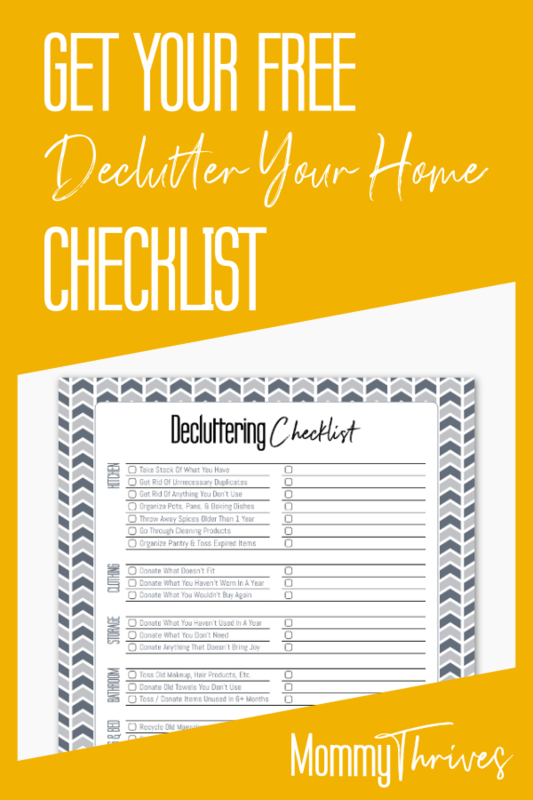 Remember, decluttering is always the first step to an organized and cleaner home. My personal rule is if I haven’t looked at it in a year or more it’s not worth me keeping. Small closets can still provide a large amount of useful space if it’s used properly. Don’t try to cram as much as you can into a closet space, everything should still be easily reached and removed from the closet without needing to take out half of everything stored in it. Do you have any small space organization hacks? Let me know in the comments below. Follow me on Pinterest for more like this and pin this to your organization boards. Any mom can tell you just how aggravating it is to look at your otherwise clean home just to see a sea of toys in your living room. 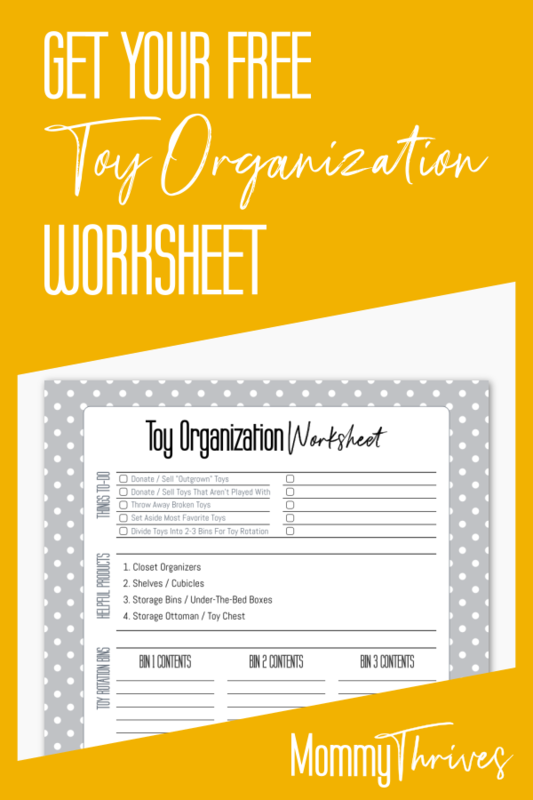 This is how I keep the toy clutter to a minimum and how you can organize your kids room. At some point every parent will walk into their child’s room and walk right back out again to go get the garbage bags. At least that’s what I told myself the day I decided to pull out garbage bags and just start throwing toys away. Before I get a whole mess of angry comments I didn’t actually throw toys away. I stopped and took a breather and put the toys away. It’s what I did after I put the toys away that made all the difference. We decluttered, we organized, and we got smart about which toys to purchase. Before we did anything we first decluttered and went through all of L’s toys. Pro-Tip: It’s best to do this part over a weekend and if the child is under 4 I recommend leaving them with a grandparent. Over the age of 4 you might try to turn it into a fun game where they can give away toys. Of course, I fully support bribery when it comes to getting your kids to do things. Like giving away old toys in exchange for that shiny new toy they’ve had their eye on. Great life lesson? Probably not, but it gets the job done, right? I created three piles; keep, donate or sell, and trash. Then I threw away any broken toys that could not be fixed. Finally, boxed up toys that were not broken but L stopped playing with and gave them away. With the remaining toys I set aside 5-10 toys that L absolutely loves playing with and split up the remaining toys into two or three bins. Some people will color code the toys to the bin. I use a toy rotation list to keep track of what toys belong in what tote. When it’s time to rotate in the next bin of toys every couple of days grab a toy to rotate in and one to rotate out. Then once all the toys are rotated in and out you can wait a month or two before you start the next rotation cycle. Doing the toy rotation this way helps your child adjust to the new toys by still having some of the older ones around. It also keeps your kids from feeling the shock of all the toys he played with one day disappearing overnight. Now it was time to start the actual organization process for all the toys. Once we buy a house I will be installing something like this in my kids closet to help keep him organized. For now, because we rent, I settled on having these hanging storage organizers for storing extra toys, stuffed animals, and blankets. With the closet set up for extra storage space the rest of L’s bedroom was pretty easy. I loved the idea of using the height of the room to store extra toys but my husband raised a good point in the planning process. L is a climber and extremely independent. For his safety we decided to keep all his toys within easy reach so he wouldn’t try to climb something and get stuck or hurt. This storage shelf unit is perfect for organizing kids rooms because it’s only 48 inches tall. This means your child can reach the top shelf easily. The deep bottom bins means the piece is also less likely to tip forward onto your child if they do try to climb it. For extra security there are straps so you can tether the unit to the wall. I like this inexpensive toy organizer for all those small odds and ends your kids seem to get a lot of. I use one bin for his dinosaurs, one for his toy cars, one for his safari animals, one for his Star Wars medals, and then the rest just kinda have odds and ends that don’t have a full set. I still had a slight issue with all the toys in our house. No matter how much I organized toys in his bedroom and encouraged L to play in there, his toys ALWAYS ended up in our living room. I knew I needed creative storage for my living room. What I didn’t want was my living room looking like a child ran our house, even though on some days it seriously feels like he does. So I started looking for grown up furniture that had storage options. I went with a storage ottoman similar to the one below. I added a couple other options that I considered too. Get a storage ottoman like this one for easy hiding of toys. A toy bin will have visibility but at least everything is in one spot and looks more organized. A cube organizer with fabric bins works really well on hiding toys and being able to put favorite books away. I love how this keeps my floor free from clutter, easily hides the toys, but still has a modern look to it. Finally, you can just get a good looking toy chest to place in your living room. Teach your child to put the toys away in their own toy chest and you will still have a nice looking living room. While toys still end up all over the place from time to time it doesn’t take as long to get it cleaned up. Luckily for me, L is finally getting into cleaning up as well. I think he likes having spots that he knows are his. Now that he’s older, he realizes it’s much easier to play in his room because he can just put all the toys away. Now he doesn’t need to move anything back upstairs when he’s done with them. What are your favorite toy organization tips? Let me know in the comments below. Follow me on Pinterest for more like thisWooden Storage Trunk and pin this to your kids room boards. You never realize how important linen closets are to your daily life until you are suddenly living without one. That tiny little closet offers so much more help than people expect it too. If you are currently living without a linen closet you probably need these bathroom organization hacks. Organizing your towels, sheets, and extra bathroom products when you don’t have a linen closet can become a bit of a challenge. The goal here though is to put things where they make the most sense. This also means you will need to declutter your bathroom supplies, sheets, and towels. If you are a towel hoarder like me this can get difficult. Ultimately, to organize your bathroom when you don’t have a linen closet you need to maximize the amount of space you do have. The right products can help you keep your bathroom organized and not cluttered. Check out my post How to Organize Your Linen Closet. This type of toilet paper holder allows you to store extra rolls of toilet paper right where they are easily accessible and you don’t need to worry about stacking them on a shelf or the back of the toilet. Get jars like this to fill with everyday products. They can go on the back of the toilet, on a shelf next to the sink, or even on the countertop itself. Behind the toilet cabinets also help with keeping all your supplies hidden and well organized. Consider purchasing one of these to increase your storage capabilities. Over the cabinet hair care storage units will keep your blow dryer, curling irons and straighteners in one spot and off your counter tops. Use plastic organizers like these for makeup brushes and plastic drawers like these to store your makeup. These can be placed under the sink or on top of the counter on on shelving next to the sink to keep it out of reach of children. Check out my post 14 DIYs For Your Bathroom. First, go through your sheet sets and keep only two sets for each bed in your house. Donate or toss any old or mismatched sheets. You don’t need them. Fold them and place the sheets inside their matching pillow case. Next, go through your towels. I know it’s awesome to have a ton of fun beach towels but how often do you actually go to the pool? Keep enough beach towels that there is one towel per person. Roll the beach towels up tight and place them on a shelf in the closet so they are out of the way. You will need that under the sink space later and they probably won’t match your bathroom decor. Keep things neat by putting them on a shelf in your closet. Only keep one bath towel per person with two extras. Unfortunately, this means you will probably end up doing more laundry but it also means you will have far less towels to clutter up your bathroom. You should only need two hand towels but keep all your wash clothes. Finally, go through all your medicine, first aid supplies, and miscellaneous bathroom supplies. Get rid of anything expired. Throw away anything you no longer need. Create a medicine box or basket with anything remaining. Hang up as many towels as your family needs, so four towels for a family of four. The two extras get rolled into tight and placed on a shelf you will install above the toilet. Keeping a couple extra towels on the shelf for the possibilities of overnight guests staying with you. You may also need them as extras for laundry day itself. Hang up one hand towel and roll the remainder. Place that one on top of the rolled bath towels. Keep washcloths in a neat stack under the sink. Put rags under the kitchen sink or in your laundry room. Store any extra kitchen towels in the kitchen as well under a sink or in a drawer if you can spare one. Only have as many kitchen towels as you need, I would only keep three or four. Donate or get rid of extras as they will most likely just clutter up your valuable cabinet space. Check out my post How To Clear The Clutter. You will use fabric baskets to hold medicine and extra supplies. Place a shelf above your doorway. This keeps dangerous to children products in a high up place. Place additional fabric baskets on more shelving above the toilet to store extra shampoo, conditioner, body wash, lotions, and toothpaste. Check out my post How To Be A Minimalist In Your Home. Fold your sheets and place them inside their matching pillow cases. Store then in nightstands in each room. If you do not have nightstands, in the bedroom closet on the shelf or in a dresser drawer is fine too. You could install shelving above the door in your bedrooms and place a basket that holds the extra sheets. This also gives you another spot to hide extras you may need but don’t have the space in a linen closet. The key to them not taking up lots of space is keeping the sheets secure in their matching pillow case. It reduces the time you spend searching through your sheet sets to find the matching parts. Storing them in the rooms where they belong also makes it easy to change sheets weekly as you wash the bedding in your house. By having the right products, decluttering, and storing your linen closet products correctly you can keep everything organized and in convenient spots. Maximize your wall space by installing usable shelves keeps countertops and under the sink free from clutter. Use fabric baskets for easy cleaning and to organize your bathroom clean and organized. Remember to store medicines and products you don’t want your children to get ahold of in one of these baskets up high on a shelf. Folding your sheets and putting them in nightstands and bedroom closets keeps them organized plus easy to find and change bedding. Remember to get rid of any mismatched or ruined sheets, towels, and expired medicines. What do you do to organize without a linen closet? Let me know in the comments below. Follow me on Pinterest for more ideas and pin this to your cleaning and organization boards. When we started to minimize and organize everything in our life I knew I would need to be creative. I didn’t want to spend a lot of money in getting organized. I would have to use things I already owned to get organized. This is when I figured out how to organize with Ipsy bags. I have a confession to make. I am a makeup hoarder. In an effort to get more organized and to minimize I recently went through all of my makeup and threw away all the old products and products I rarely used. It didn’t help my makeup hoarding but at least I wasn’t applying old makeup to my face. Replenishing my makeup supply would end up being costly and I’d have so much left over that I wouldn’t ever use it all. Let’s face it as a work at home mom I rarely wear makeup and when I do it’s usually minimal. To solve this makeup hoarding problem I signed up for Ipsy. For those of you who don’t know what Ipsy is it is a subscription service where you get 5 beauty product sample products in a cute little bag delivered monthly via the mail. The service costs $10 a month. Now I know what you are saying, “Crystal how can that possibly help your hoarding issue.” To be honest it does and doesn’t at the same time. You see I am getting 5 sample sizes of makeup every month. This works well because they are sample sizes. Once they are used up that’s it. I don’t hold on to products longer than what they are good for because once they are done they get thrown away. While I’m collecting makeup I’m using it up before it goes bad, instead of throwing away unused product. Additionally, I get to try more products keep track of which ones are my favorite so that I can purchase full size versions it I’ll be using them in my daily routine. On top of new makeup I also get new cleansers and can I just say these cleansers are much more luxurious than what you get cheaply at the grocery store. The best thing is Ipsy stays within your guidelines of the preferences you set. This means if you and your friend both sign up you are both going to get different things in your bags. So it’s been 4 months since I signed up and I have 4 bags. There are loads of things you can do with these bags. I am giving you at least 30 ways to utilize your Ipsy bags. Separate out your makeup based on location it’s used. Use as travel bags to store just the essential products. Put your travel sized products for the shower in a bag. Keep small scissors, nail clippers, or other sharp objects in a bag. Store feminine products in a bag. Keep all your pens in one bag for easy finding. Turn a bag into a wallet or clutch. Store on the go makeup products. Keep first aid stuff in a bag, or get the ultimate first aid kit here. Use them as a change purse. Use them to store license, registration, medical cards, and other important documents you may need to keep handy. Use them to hold paperclips and binder clips. Use them to hold post it notes. Keep pens in them to put in a drawer for a clear desktop. Store earbuds and other small computer accessories. Use a bag to hold extra flash drives or SD cards. Keep tiny screwdrivers in a bag. Keep extra condiment packets organized in your desk. Keep extra makeup or travel sized containers at your desk organized. Hide extra feminine products in your desk with the bag. Keep crayons in a bag for easy access. Store small toys like toy cars in a bag for road trips. Keep post its and crayons in a bag for coloring on road trips or at restaurants. Keep travel size medicine to fevers. Store packets of moist towelettes in them to wipe off hands. Keep travel size candy or hide emergency snacks. Ipsy bags are great for organizing all of the small accessories in your life. I’m sure you can find many more ways to utilize your Ipsy bags to get your life more organized. If you haven’t joined Ipsy yet you can use my code here and I’ll get points that can be used to purchase beauty products. What ways are you using your Ipsy bags? Leave a comment below with your thoughts. Also, follow me on Pinterest for more posts like this.